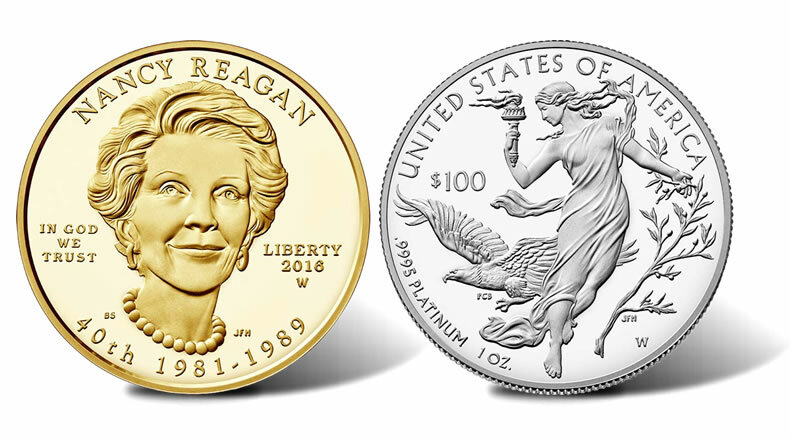 Based on the bullion market, launching prices for Nancy Reagan gold coins could range from $820 to $865. This year’s proof Platinum Eagle will open at $1,350. On Wednesday, June 29, the U.S. Mint may raise prices on about two dozen gold coins. 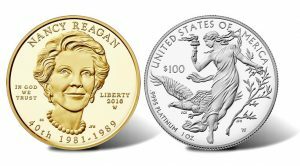 The agency on Wednesday will also publish pricing for the upcoming 2016-W Proof American Platinum Eagle and 2016-W Nancy Reagan First Spouse Gold Coins. The proof Platinum Eagle goes on sale Thursday while Ronald and Nancy Reagan coins launch on Friday. U.S. Mint policy is to set pricing on collector gold and platinum coins based on weekly averages of London bullion prices. The agency most recently increased prices on June 15 when gold climbed to within the level of $1,250.00 to $1,299.99 an ounce. The yellow metal has since rallied to a two-year high and is now trading near $1,313 an ounce. If Wednesday’s LBMA gold price for the AM is above $1,271.85 an ounce and the PM fixing is over $1,300.00 an ounce, then prices of U.S. gold coins will increase by as much as $50 for every ounce of gold they contain. Platinum, meanwhile, has been stuck for several weeks between $950.00 and $999.99 an ounce. This year’s proof American Platinum Eagle will open at $1,350.00, which is $150 higher than last year’s coin but $300 less than the one from 2014. *The centennial gold Mercury dime has been unavailable for some time. The United States Mint made six pricing adjustments earlier in the year, increasing them in all but one instance. Past adjustments have tended to happen on Wednesdays at around 2:00 p.m. Eastern Time. This article will get updated with what actually happens. Update: The Mint increased prices. The new prices are listed in the "Possible" column above. The above gold coins are found on the U.S. Mint’s website located here. With platinum trading at $976 per ounce afterhours now, the Mint’s possible issue price of $1350 for the 2016-W Proof Platinum Eagle coin is ridiculous! An estimated premium of $374 over spot price for a coin with a high mintage of 10,000 coins compared to last year’s 4,000 mintage is a slap in the face to collectors of the series. Platinum is only up about 10 percent this year. Why the much higher premium? These will not sell out quickly IMHO. I agree with you. I’ve already decided not to purchase one. Not related to the article, but what are the odds they don’t release the silver eagles. Have they ever been released later than it looks like this year? The Proof & Burnished silver Eagles are being offered sometime this Summer later than usual because of a law passed in December requiring them to have special 30th anniversary edge lettering that the Mint was surprised by & said it would take awhile to make the collars needed to strike them & the test strike phase on them. Why show the Gold Mercury’s new price if it’s not available for sale right now? Some people wanted a 3-coin centennial set. The way the mint has been running there is no telling what will happen to the remaining Gold Mercury Centennial Coins. US Mint officials refuse to state what they are going to do with the nearly 9,000 unsold gold Winged Liberty Head dimes, despite repeated daily attempts by reporters to get an answer. This situation has never happened before in such a bad manner & Congress or the Treasury Secretary need to tell them to sell them ASAP ! That is their job afterall.